Bus from Singapore to Desaru is one of the most popular mode of transport for tourists and travelers to travel directly from Singapore to Desaru. With the opening of Desaru Coast Adventure Waterpark, the demand of bus service to Desaru has increased significantly. WTS Travel is the only bus service provider offering bus from Singapore to Desaru. WTS Travel is one of the largest fleet-owner in Travel & Tour industry in Singapore, with a fleet of more than 60 deluxe coaches equipped with well-maintained deluxe coaches that went through various stages of stringent screening and testing. WTS Travel bus schedule from Singapore to Desaru is very limited. There is only one daily departure from Singapore to Desaru. The travel time from Singapore to Desaru is approximately 2.5 hours depending on the custom traffic condition. The custom clearance could take much longer time during weekend. The bus fare from Singapore to Desaru is charged at SGD 17.50 per seat. The boarding point is located conveniently at Singapore Flyers, one of the popular landmark in Singapore. The arrival point in Desaru is located at Desaru Coast, which is within the premises of Desaru Coast Adventure Waterpark. Desaru Coast Adventure Waterpark, featuring the largest wave pool in Southeast Asia, is one of the world's biggest water parks, set against the backdrop of a Malaysian fishing village. In Desaru Coast Adventure Waterpark, visitors can experience the largest wave pool in Southeast Asia and the first water coaster in the region. There are up to 5 splash-tacular zones feature a unique mix of over 20 wet and dry rides, slides and attractions for everyone to explore. Plan to chill out with your family and friend during this hot weekend? 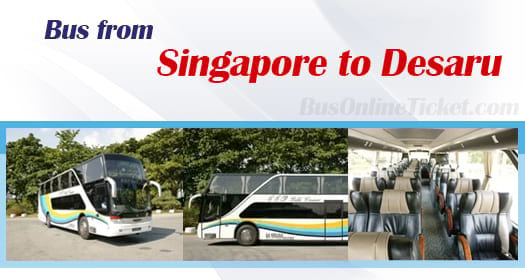 Book your bus ticket from Singapore to Desaru now at BusOnlineTicket.com. Making bus ticket booking with BusOnlineTicket.com, you will get instant confirmation upon payment. Making online booking with BusOnlineTicket.com could help you to secure your seat before travelling.